As long as there have been languages, there have been interpreters. 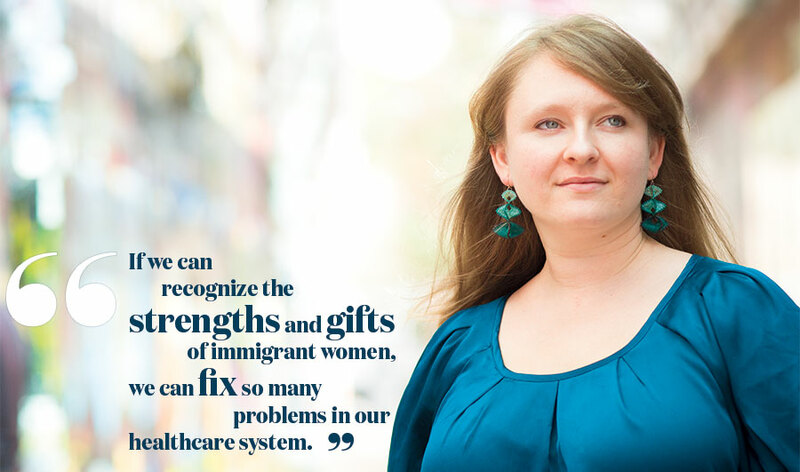 Learn how Maria Vertkin ’11 is harnessing this ancient profession to create better futures for immigrant women in Greater Boston. HIGH POVERTY RATES, homelessness, low wages, loss of cultural identity—these are just some of the challenges women immigrating to the United States may experience. It’s a dynamic that Maria Vertkin ’11 understands innately and is working to change. A native of Russia, Vertkin immigrated with her family to Israel at age six, followed by another move to the United States when she was 11 years old. With finances tight, Vertkin launched her first venture, a business directory for home contractors. Nine months in and after many sleepless nights, she received her first check from a paying customer. Despite the achievement, she felt something was missing. That question led her to human services classes at Massachusetts Bay Community College. After completing two years of her education there, she knew she wanted to pursue a bachelor’s degree in social work, and she knew she wanted to do it at Regis. “Regis is the only school I applied to,” says Vertkin, who received the Regis Presidential and Class of 1961 scholarships, which made the move to Regis financially feasible for her. 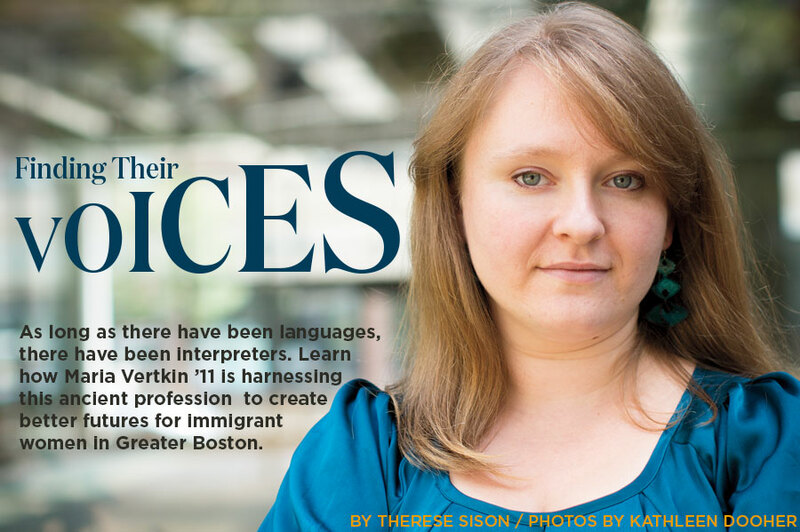 Vertkin was still a student at Regis in 2011 when she created Found in Translation, a nonprofit providing medical interpreter certificate training and job placement services to low-income, bilingual women. She was inspired in part by her life experiences, and developed the concept while working at Rediscovery, an organization helping at-risk and troubled adolescent boys transition from treatment facilities into the community. The project was initially funded by a $40,000 Kip Tiernan Social Justice Fellowship, named for the founder of the nation’s first women’s shelter, Rosie’s Place, in Boston. The centerpiece of Found in Translation is the tuition-free Language Access Fellowship, featuring a rigorous, 120-hour curriculum that well exceeds the minimum of 40 hours required by the National Council on Interpreting in Health Care for medical interpreter training programs. This comprehensive education ensures that Found in Translation alumni do not only excel in their job placements, but are at the top of many employers’ lists to fill medical interpreting positions. During the program, students cover the fundamentals of medical interpreting, learning medical terminology in multiple languages, anatomy, and physiology taught by practicing clinicians; receiving language coaching; and exploring medical interpreting ethics. Found in Translation’s most popular languages include Spanish, Haitian Creole, and Arabic; others represented among the students include everything from Swahili to Turkish to Thai. A unique piece of Found in Translation’s approach to education is its full complement of supportive services for students, including on-site playgroups for students’ children, transportation assistance, mentorship programs, job skills training, and financial literacy education. One of the most significant ways that Found in Translation stands out from other medical interpreter training programs is what happens after a student’s education is complete, according to Vertkin. The organization provides graduates with job-seeking assistance and resources. Students also have opportunities to be placed directly into competitive, well-paying positions offered directly by Found in Translation— a pipeline that not only creates an employment path for graduates, but also provides a unique method for Found in Translation to generate revenue. In addition to its job opportunities and resources, Found in Translation offers multi-year alumni services, including access to professional development resources and workshops, help with covering the costs of national certification, and set pay raises when specific milestones are achieved. This multi-pronged approach has proven to be extremely competitive. In its first year, Found in Translation received 164 applications for 21 class spots; for its most recent class of 35 students, 485 women applied. Application rates like these have made Found in Translation one of the most selective medical interpreter training programs in the country—and the only one boasting an Ivy League admission rate, according to Vertkin. The results have earned accolades for Vertkin: She was named to the 2016 Chronicle of Philanthropy 40 Under 40 list, and a 2016 Forbes 30 Under 30 Social Entrepreneur, among many other awards and honors. And yet, despite the praise, Vertkin finds her greatest fulfillment in another source. Importantly, Found in Translation students aren’t the only ones benefitting from the program. Providing patients with access to trained interpreters is more than a crucial way of addressing healthcare disparities—it is a federally protected civil right. According to Vertkin, for some patients, the interpreter is the single person in the entire hospital who can understand them. And with the U.S. Bureau of Labor Statistics reporting that the number of medical interpreter positions is growing at a rate of more than 45 percent per decade, Found in Translation students are well-positioned to help fill that critical gap. Learn more about Found in Translation at found-in-translation.org.